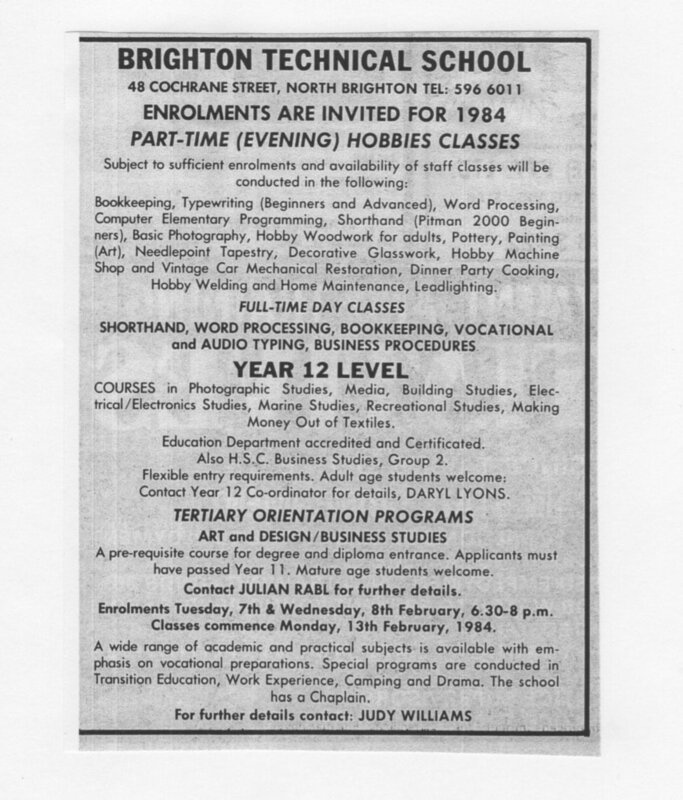 Marketing in 1984 - Brighton technical school, Victoria, Australia. BERWICK AND COCHRANE STREETS, BRIGHTON. Black Rock, Beaumaris. Wednesday, January 18, 1984. 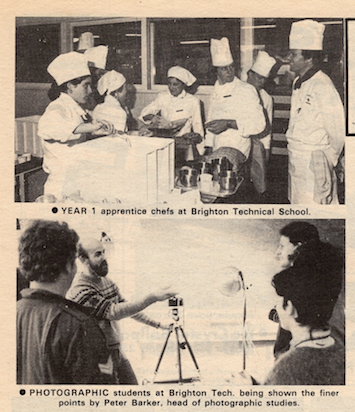 For more than 60 years, Brighton Technical School has provided a technical education service for the district. Centrally situated in attractive surroundings, the school is well equipped and attracts students from interstate and overseas to some of its special courses. The most popular full-time courses are in art and design, photography, electronics, building, textiles, marine and outdoor education studies. Recent exhibitions of students’ work in art and photography have produced wide acclaim of the high standard of the work. The school is making a special effort this year to promote its part-time courses particularly those in computer programming, typing, bookkeeping and word processing, leadlighting (taught by instructors of the flat glass trade), dinner party cooking, vintage car restoration, dressmaking and tapestry, metalwork and welding, pottery and painting. Co-educational programs with a wide range of electives are also available at Years 7 to 11.